Please view in full view, its so much better and detailed than the thumbnail size view, Thankyou so much! Hows it going? This wall might look familiar because I got the idea for it after I made the Kira-and-Lacus-in-Love Group's background. My sister agreed with me and said that it would make a nice wallie so I did. I tweak it alot from what I did in the group's background, I added some feather brushes in there, and used some scans of doves and placed them in the wallie, added more clouds and gradients and etc. XD . I wanted a soft looking background, a wallpaper that make you feel calm and serene, and like the places my Laurent always tells me, a place that takes you away on a far away journey. Once again I used a lot of layers on this wallpaper, so many I forget. It was because I had so many different layers of clouds on top of more clouds and gradients and etc.. :) I worked really hard on this wallpaper, even though it took me awhile to submit it, I really do love the result so much XD. Thankyou so much to all the people who faved my last wallies, you all are so sweet to me thankyou again your the best XD *hugs to all*. Have a great day everyone!. oh i love this..oh its so pretty..really i like the scan of them and i like the clouds and the background this is so pretty sam..*smiles*..i love this. Pigeons are serene... where did you get them? WHAO ! ! ! Kawaii desu ! Ow ow, I get such a cosy feeling looking at this new wallie of yours. The sky is so serene and brings along a feeling of peace. I love the feathers ! ( hehe, you know I love those a lot, ne ^^ ). Wow, and where did you find or how did you make the birds ? They look really nice. Hmmm, this is really a great way to use Eeva-chan's pretty vector. Quote: ... and like the places my Laurent always tells me, a place that takes you away on a far away journey. Another great wall, my dearest Sammy ! I really love it, so this goes to my favs straight away ! *clicky clicky* I hope you get a lot of favs, 'cause you really deserve them ! I'm once again proud of you ! 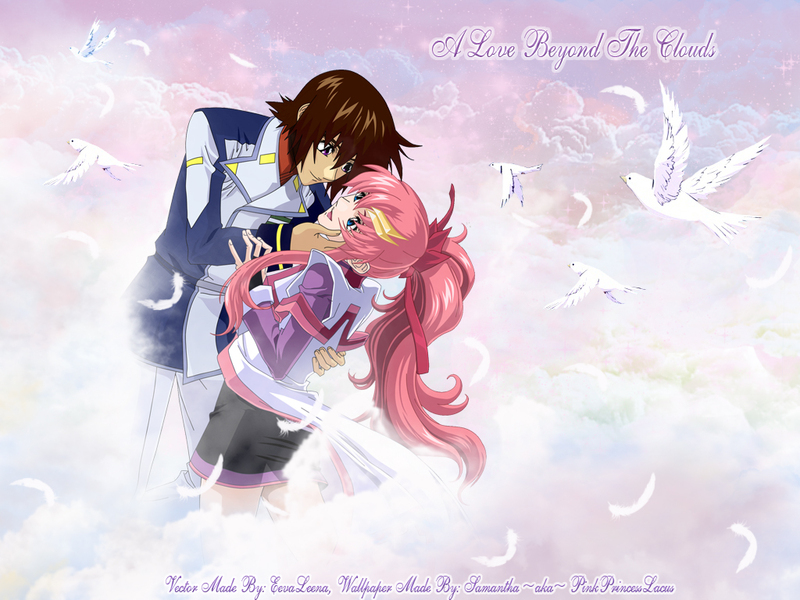 Beautiful Lacus-san! The bg you made is simply amazing great work! I love the birds you put in there! Gives the wallie a nice touch! It's sort of magical as well! Keep up your amazing works girl! I WANT TO BE KIRA! Great work, thanks for sharing it! lacus looking different isn't it?